Nationally recognized in rice bran oil production Bathinda Chemicals Limited was once again named with B.K. 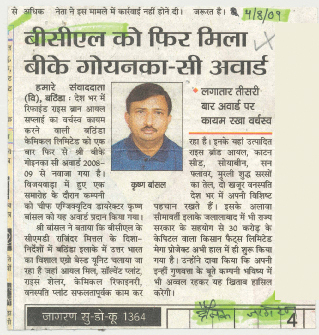 Goenka award for the year 2008-09. Organized in Vijayawada, the Chief Executive Krishan Bansal was handed over this prestigious award. Sh. Krishan Bansal told us that, following the directions and ethics set by Sh. Rajendra Mittal, Bathinda situated in northern India’s has its largest agro based manufacturing unit which has Oil Mill, Solvent Plant, Rice Sheller, Chemical Refinery and Vanaspati plant. Produced here are Rice Bran Oil, Cotton Seed, Soybean, Sun Flower Oil, Murali Mustard Oil, Do Kajur Vanaspati are some popular in the market. He added that in accord of government’s permission, the group has commenced of its mega project at Jalalabad which has estimated capital investment of 30 crores. He guaranteed that the group shall once again achieve this prestigious award next year maintaining its dedication.